Falling fingers without wrinkles too Stylish Kara Blouse! V-neck line, suitable pavement and front wrinkle! I am satisfied with the rounding hem. It's a single piece or a layered Kara Blouse! It was made with colors that fit very well with spring. Skinny Skirt It is possible to match anywhere, so it is good to wear trendy! A perfect pit that makes no lines! As soon as I go up, I have full week .door.Breadth. 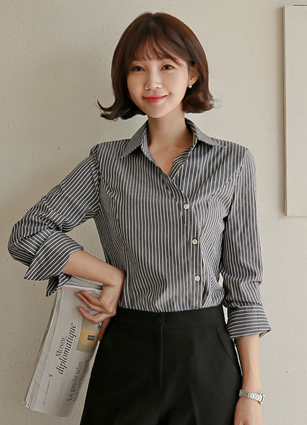 It is a blouse of good quality because it is made of cotton and it is baseless. Soft and comfortable to wear through the bio-washing! Pitt's shirt is cool and tidy with sloping cotton that can be fully worn until summer. Haejueo further refinement closure line wrinkles points up!